Cornerstone offers a wide variety of electrification systems to provide power and control to your material handling systems. You can contact our sales team to provide you better information on what systems would work best for your specific project. Typically used on monorails, runways and bridge crane applications, these systems utilize insulated bars to transmit electricity through sliding collector assemblies. They power all your various needs like trolleys, hoists and motors. Various types of metals are available upon request; aluminum, galvanized steel, copper, or stainless steel. Generally split into two different types, Festoon Systems come as C-Track Systems or Tagline Systems. Utilizing flat cable commonly, round cable is also used to power your equipment. 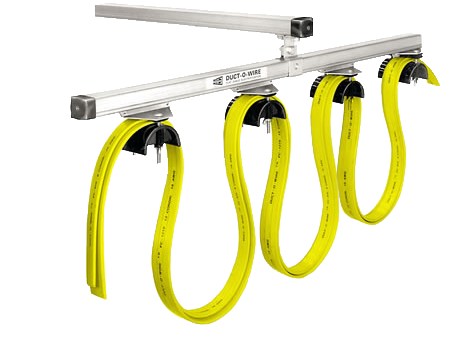 C-Track Systems are used to provide power to the runway, power and control to a bridge crane, or lower voltage control to a separate pendant circuit. Also known as power reels, these are used as an alternate to powering electric hoists. A power cable is wrapped around a spool drum which rotates to give or retract the length of cable needed for your project. It can be installed in a fixed position, as well as on a swivel base to allow different degrees of rotation and various lengths of cable. These come with other options including ball stops, cable grips, guard rails, limit switches, cable guides, etc.